C-Span 3 is airing the Pat Tillman hearing live. Go here to watch. Former Defense Secretary Donald Rumsfeld decided to show after all. Today, the Oversight and Govt. Reform Cmte. holds a hearing on Army Crpl. Pat Tillman's death by fratricide. Senior Defense Dept. officials describe what they knew about the incident. 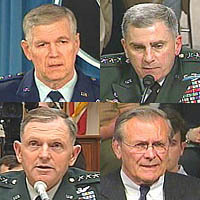 Witnesses include; Gen. Richard Myers (Ret. ), Gen. John Abizaid (Ret. ), Gen. Bryan Douglas Brown (Ret. ), and fmr. Def. Sec. Donald Rumsfeld. Feel free to live-blog in the comments if you're watching.